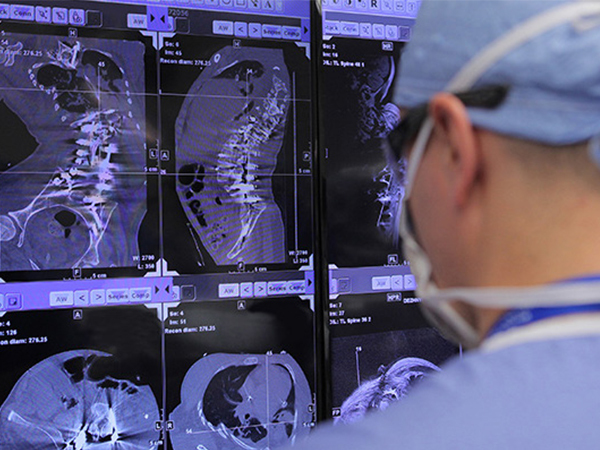 35% of NYP Och Spine cases are revisions of procedures performed at another hospital. As the dedicated spine center, NewYork-Presbyterian Och Spine Hospital brings together world-class Columbia physicians, including spine surgeons—both orthopedic surgeons and neurosurgeons—physiatrists (rehabilitation medicine physicians), physical therapists and pain management specialists. We treat patients of all ages for every type of spine issue—from everyday back pain to the most complex spinal deformities. Our personalized care allows our physicians to determine the most appropriate non-surgical or surgical approach to achieve optimal results. Our internationally renowned orthopedic surgeons and neurosurgeons use minimally invasive techniques wherever appropriate, and also perform the most complex spinal reconstructions—all with extraordinary precision. Advanced spinal imaging. Our spine specialists and dedicated clinical team, use advanced imaging capabilities to perform a host of nonsurgical and surgical treatments with greater precision. Treatment without surgery. Many disorders of the neck and back can be treated without an operation. During your evaluation, we determine if non-surgical treatment could be an effective option for you before resorting to surgery. Specialized spine surgery. Our internationally renowned orthopedic surgeons and neurosurgeons use minimally invasive techniques wherever appropriate, and also perform the most complex spinal reconstructions—all with extraordinary precision. Learn more about our customized approach to spine care.